Have I mentioned white is my favorite color? Aside from being seasonless and looking good on, and with everything, white makes me feel pretty, and even a little bold, as so many people seem to 'fear' wearing it. 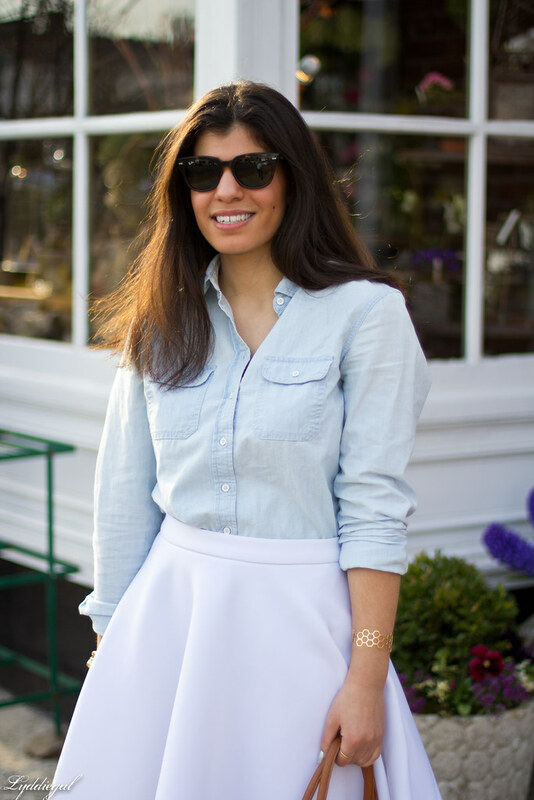 The bright white skirt paired with the washed out chambray shirt was the perfect look for a stroll around downtown New Canaan on a day so warm it could have been mistaken for summer. Wish I could have done a bit more shopping, but the store fronts of downtown New Canaan can only be my reality in outlet form, with a big sale going on. I have a similar faded chambray shirt. I don't have a white skirt, but I am now going to pair it with my white shorts. This is such a fresh look. Love the shape of that skirt! White really is a nice color. It's so fresh and clean feeling. Great bag, too. Love the tassels! That skirt is so sassy and it looks great with your shirt. Have a beautiful day, lovely. That skater skirt is so fun and flirty on you! I seem to always spill something on me when I'm wearing white, ha. absolutely love this! so cute girl..one of my favs of urs! Super cute skirt, love this look on you. I love white, but I don't have enough of it in my closet. I love this skirt so much! It seems like it would be such a great, versatile piece. Gorgeous, Lydia! It's funny - I never think of white as a bold shade but you make a good point; so many people are afraid of wearing it, especially in the presence of ketchup and red wine, that there is something bold about daring to! White and chambray as a perfect match as far as I'm concerned. And one I don't wear often enough. 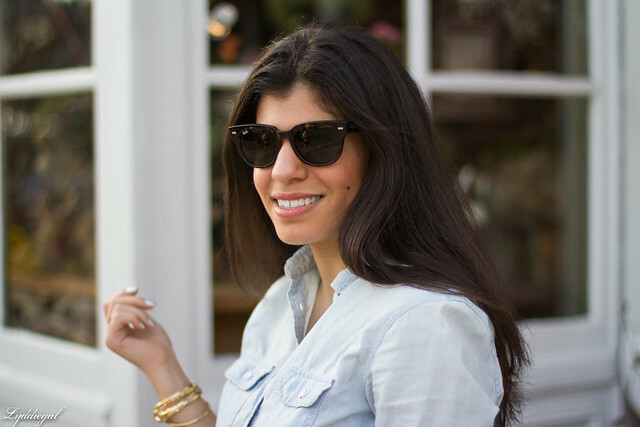 Time to take some inspiration from this look! If only I could take my photos in New Canaan... what gorgeous store fronts. Such a cute spring outfit! Love the shape of that skirt on you. I think that window shopping can be fun too--it's all about the stroll really. 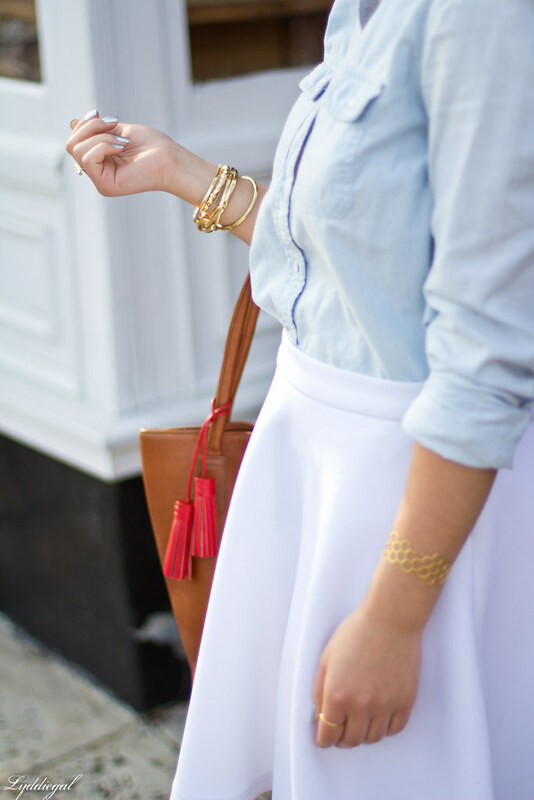 I love the crisp white and chambray! Beautiful skirt! And I'm loving it with the light wash chambray. This look is gorgeous and timeless! I have a cream skater skirt that I absolutely love, and it pairs so well with my chambray shirt like you've styled your look. Absolutely love this outfit on you! I can never seem to do white well but I just adore it on you. You look so crisp and sophisticated! This combo is really pretty on you! I absolutely adore white. I've been adding more of it to my wardrobe. It looks so good and can be paired with so many things. That skirt and top look great together Lydia. So crisp! Gorgeous! I love how fresh this look is. And the cut of your skirt is perfection! Love this skater skirt, so chic and the perfect length! The white looks so nice. I'm too occasionally afraid of white. I'm always spilling things on myself. I want this whole outfit! Pinning! Being super fair, people use to always tell me I shouldn't wear white or blush, but I wear it all the time and I actually think it looks good! Screw them! :) You look so amazing! Loving that skirt!! I can see why white is your favorite color. It looks great on you! I can't believe that skirt was just $40 - it looks so perfect! Ahhh oh my gosh this is probably one of my favorite of your outfits! I love the light blue and white together! Haha and I completely agree with what you say about how white makes you feel! :D I just bought white wide-legged pants and I'm pretty excited to try them out...! I love that white skater skirt!! It's just perfect for spring and summer!! So many summer white looks - so pretty and feminine! Love this simple look! White is a great color - so fresh! Love the skirt, is it new ? Did you cut your hair ? Oh, you're like a sunny spring day. You just look utterly lovely.